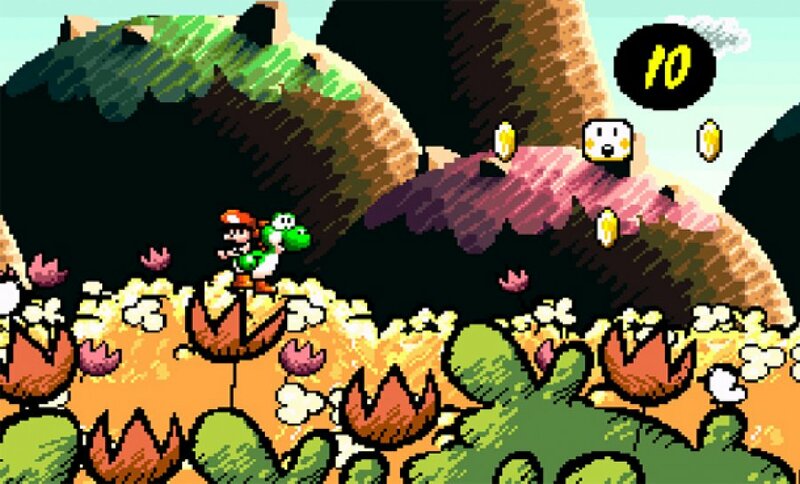 Super Mario World 2: Yoshi's Island was definitely something of a gamble for Nintendo when it launched back in the days of the SNES. The Super Mario series was only four (technically five) games long, and instead of making a safe sequel to the popular Super Mario World, a game was made starring his dinosaur companion, Yoshi. Fortunately, Yoshi's Island turned out to be a fantastic success, later going on to spawn its own spinoff series of platformers. It was surprising, but once the development was really underway, there were very few ideas that we had to jettison. We knew this would be the last Mario game we made for the Super Famicom, so we wanted to go out with a bang and include all we could. If it was a simpler game, one that you just beat once and are done, then you could probably get rid off half of these mechanics, but we designed Yoshi's Island so players would be able to replay the stages many times. That ended up giving us a lot of leeway for all the things we wanted to include. For the full interview, check it out here; it's mostly focused on Yoshi's Island, but there's some interesting discussion over a certain "64-bit machine". What do you think? Did you appreciate Yoshi's Island for what it was? What would you like to see out of another game in the sub-series? Share your thoughts in the comments below. I never played the original game, but the GBA port was one of the first games I ever played. I absolutely loved it, this is still one of my favorite platformers. Didn't Miyamoto initially loathe the production process because Nintendo basically said, "Make it more like Donkey Kong Country"? I have to admit that I wasn't very fond of this game, but after playing woolly world and giving it a second chance on the 3DS... I ended up enjoying it. I even bought a real retail copy for the GBA, since its a bit blurry and weird on the 3DS. I still find it to be a bit too hard though. But not as bad as the second one, which was just too much for me. @chiefeagle02 well, even in the case that's true, it wouldn't make sense for him to complain about the game in an interview. At least not in one from 1995 when the game was new. It's interesting to hear of another staff member shooting down Miyamoto's ideas. It's easy to think of Miyamoto's opinion as the final authority on everything, lol. @Nicolai It's just more proof that whatever Miyamoto says, doesn't necessarily mean it must be done. Miyamoto is a visionary, imo, but he's also human. An absolute masterpiece and without doubt,one of the finest games there has been or ever will be.I originally played it on GBA and loved it,but it wasn't until I played the original a few year back that I realised how incredible a game it really is.It's ridiculous Nintendo hasn't found a way to make this available for VC,as good as the GBA one is,it doesn't compare to playing the original on the big screen.For me,it's the finest game Nintendo has ever made. I love this game, I never got around to playing the originals but I did grow up with the slightly watered down GBA port. It's actually one of the first games I ever owned. The only Yoshi game to come close to this was Wolly World, IMO. Never cared for the handheld games. "If it was a simpler game, one that you just beat once and are done, then you could probably get rid off half of these mechanics, but we designed Yoshi's Island so players would be able to replay the stages many times. That ended up giving us a lot of leeway for all the things we wanted to include." So is that why they put in those stupid Fly Guys holding a red coin that fly away just seconds after they appear? Rage from that aside, Yoshi's Island is a fantastic game. It's unabashedly creative. I just wish the SNES version could make it to the Virtual Console because it's far more superior to the GBA. @chiefeagle02 "Donkey Kong Country proves that players will put up with mediocre gameplay as long as the art is good". Ha, Miyamoto throwing the shade! I adore this game, one of Nintendo's absolute best. @MitchVogel Except that he never said that. @Nicolai This was in 1995 - The N64 and games like Super Mario 64 and Ocarina of Time weren't even on the horizon yet. While Miyamoto was obviously already a very important and much-respected developer by then, he wasn't yet the senior manager overlord he is today. What's so inferior and watered down about the gba port...? As far as I know it actually has more content. @Franklin that should read mustachioed, oops! my mistake, all corrected now. In my opinion: Best game ever! It was my first own game on the Super Famicom and I loved it. And looking back, I still see it is perfectly designed. Dare I say it....I enjoyed this more than Super Mario World. Incredible level design, brilliant graphics and the characters had so much charm to it. I didn't even mind the crying Mario that much as it made you ensure you never got hit in the first place! Haha Mario with a beard. This was my last SNES game before trading all my games and console for a PS1 (boooo!!). Did love the game. I've recently enjoyed the GBA version on the VC. However I didn't realise the differences between it and the SNES version at first. Yoshi's noises are more annoying in the remake, and some of the effects aren't as good. Check out the differences in the 'Touch Fuzzy, Get Dizzy' level. The background effects are better in the SNES version when you touch Fuzzy!! @OorWullie Bring the SNES version. Am curious how they 'knew' it'd be the last Mario game on the system when Mario 64 then started development on it. But yeah, Yoshi's Island is pretty amazing even now, though I don't really like how the sequels have never really been able to recapture the magic. The closest one's come I think is Woolly World, and I also think DS is decent (New Island isn't, and Story while an okay platformer is kind of lacking and doesn't feel much like Island), but nothing has really been in the ballpark yet. Wonder if he still harbors any bitterness over DKC doing better than Island did. Remember at a time he was derogatory toward DKC then later attributed it to being overworked on Island. I remember being ten years old and absolutely falling in love with this game when my parents rented it for me at blockbuster. I got it for Christmas later that year. There was something so new and fresh about it to me at the time, and I really think it's the first time I actually took time to appreciate the dedication Nintendo puts into art, music, details, etc. I wish the series would evolve a bit in the future. Yoshi's New Island and Wooly World both felt a little stale to me in terms of gameplay. Still love ya though Yoshi. @Meowpheel It's not that it's really watered down as like you say,it actually has extra content,if I remember correctly,the GBA version has an extra secret level for each world.But the visuals and audio definitely take a hit,it's especially noticeable on the 'Touch Fuzzy,Get Dizzy" level.Plus it's zoomed in more like all of the handheld Mario games and looks more blurry.That said,it's still a fantastic port and gameplay wise it's near identical. It was a real innovative game that still feels fresh. While I think Wooly World is a better game, it took 20 years, and it's only a slight improvement (graphics aside). @FragRed: ...And to this day, Nintendo never gives tours of their headquarters, because screams can still be heard from office 2F on the 9th floor. I was just gonna say, Yoshi's Wooly World was the sequel we've been wanting for 20 years. Why didn't it sell better? I mean it's doing ok, think around 1.2 - 1.5 million. But that game, being the long awaiting sequel that ACTUALLY delivers, should have seen success like 3D World. Too bad Yoshi's New Island was such a pile of leavings. I had high hopes for that game. The original SNES adventure got everything right - and, might I add, had the best final boss in the entire series up to that point. I remember being a kid and playing this for the first time. Was such a good game! Still is. I am probably one of the few people left that hasn't truly played this game. I played it at my aunt's house when i was a little kid many years ago, i just never really finished it. The sad thing, is that I stil have it for free as a gift for being an ambassador. I just haven't booted it up yet! My favorite snes game of all time! Ironically, when I first saw this game as a kid, I thought it was SUCH A STUPID, childish game, going off of just the visuals. Yeah, I was one of 'those' kids back then. Nowadays? This is one of my favourite games, if not my TOP favourite game of all time. I did give it a chance eventually even back in the day (because my sister owned it, I believe), and I think that helped in me liking this game more in the end. These interviews are always fun to read through too, new AND old. Though I'm sad there won't be any more Iwata Asks.. I hope that doesn't mean the end of the more insightful interviews they brought. Also, Bearded Mario? That would've been weird to see. And @Dpullam You owe it to yourself to give this game a chance! If you enjoy platforming games at all, you cannot afford it NOT to play this gem. @CB85 The N64 and Super Mario 64 was released in 1996, not even 11 months after Yoshi's Island. I guarantee you it was on the horizon. Yoshi's Island will be the next SNES for New 3DS. @Nintendian would be nice but doubt it, It hasn't been released on any virtual console yet, including Wii's. Not sure why. Star Fox hasn't either. @dok5555555 Star Fox and Yoshi's Island both had the Super FX chip and the probable reason they haven't appeared on VC is because of emulation of said chip is either too difficult or can be cause for patent infringement. If they could get past this, I'd bet that Star Fox 2 would have seen an eventual VC release. It was almost complete after all. I kinda got the feeling it will never happen, but I'd love the SNES version on new nintendo 3DS virtual console. I'd pay the fudge out of it. really one of the best platformer ever made in video game history, imo. One day he said "lets make a really boring annoying game where a baby cries 75% of the time and we'll make money"
One of a handful of games that I would consider utterly perfect. I've only played it twice from beginning to end, so it retains this very special, almost mystical, quality for me. I always liked Yoshi's Story better; not entirely sure why. @Yoshi Yes from Nintendo's point of view obviously, but nobody outside of Nintendo knew much at all about it. They had no idea about Nintendo's (Miyamoto's) future games and the impact they would have on the entire industry. I'd love to have this on N3DS SNES VC. Never the biggest fan of this game. Too much of a collectathon for my tastes. Also didn't love the Sonic-esc grab the baby (rings) and take multiple hits. I love Yoshi's Island. It's more challenging then SMW and very fun. DKC isn't mediocre in the least. @Tempestryke I agree, and that's why I find that quote to be so shocking. I know that Miyamoto didn't like the pre-rendered graphics of DKC, but I never knew it was to this extent. It's very interesting that he couldn't get past that, and viewed the whole game negatively because of it. @MitchVogel Do you have a source that he really said that? @Yoshi It doesn't need to be on VC. SNES 9X runs it perfectly on Wii or vWii if you must play it. Far better than Nintendo's tardy emulation which blurs visuals and darkens output these days. Also with the option in to custom crop, use filters if required everyone is happy. Nintendo's VC is a discredit to the past. It makes me sick. @AshFoxX Emulation is certainly not too difficult. Some kind of legal issue is preventing it. But knowing Nintendo and their already terrible emulators it probably is a challenge for them. Anyways, imagine if Nintendo did release it on VC. You'd probably pay £10 for cut features and dark, blurry visuals. That seems to be their thing these days. @Lizuka Of course they knew it was the last Mario game! @liveswired They should let M2 do it. @liveswired Yet ANY filter with the homebrew SNES emulators on Wii or vWii causes the entire game to drop in frame rate. That's how close it is to hitting the limit. The only thing Nintendo could be criticized for is attempting to display their games in a 4:3 aspect ratio, which requires stretching + blurring, but that is something done by hardware, not software, and should have been an option from the very beginning. Nintendo is simply more interested in accurate emulation, and I'd take their emulator over the one I develop for if I had an n3DS. An SNES9x is not THAT accurate. It's just enough that for something that is free, we don't mind it. @blackoak Thank you for those translations. "When most people think of a sequel, for movies and whatnot, I think they usually imagine a simple rehash of the original with the visuals and presentation upped a notch." New Super Mario Bros., ladies and gentlemen.